Over the last few years, Johnson C. Smith University, led by its president Dr. Ronald L. Carter, has worked hard on initiating revitalization efforts of the community where the university sits. Pegged as the Northwest Corridor, including a unique intersection where Beatties Ford Road, West Trade Street, West Fifth Street, and Rozzelles Ferry Road all meet, just outside of Uptown, the impact of JCSU's efforts are starting to come to light—literally. The latest is “Passing Through Light,” a new work of public art using LED technology that's located at the I-77 and West Trade Street underpass. See more photos of "Passing Through Light" on JCSU's Facebook page. 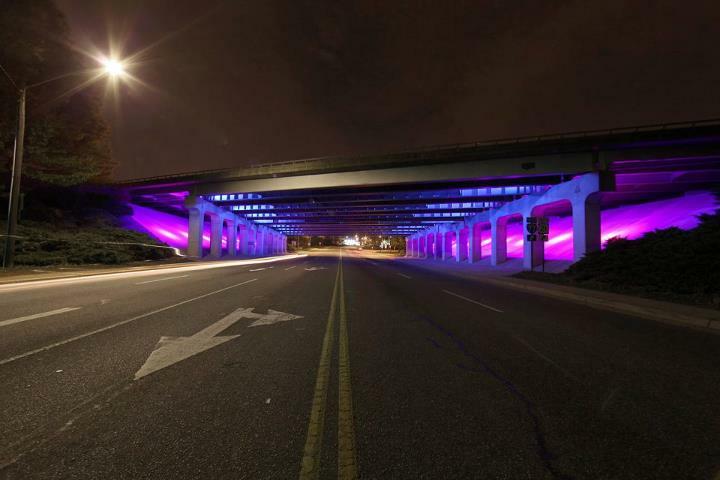 Lighting the underpass was a priority for Dr. Carter to make it safer for pedestrians and students, and also to make it more visually appealing to the many motorists who drive through it each day. For too long, the area around the university was seemingly neglected by the city, when it has both a valuable history and is only a mile from thriving Uptown complexes like Gateway Village, which is home to Johnson & Wales University, Bank of America offices, and numerous other corporate tenants. "Passing Through Light" was made possible by funding from JCSU and the City of Charlotte. The project was also supported by the Charlotte-Mecklenburg Public Art Commission, which is managed by the Arts & Science Council. Through this public/private partnership, they commissioned Austrian artist Erwin Redl to create the artwork that consists of three sequences of light that slowly loop through a color gradient. If it looks familiar, it's because Redl also created the ribbons of lights that wrap around the exterior of the NASCAR Hall of Fame, which opened in Uptown nearly two years ago. In this video, WFAE takes you inside the LED-lit public art and talks to the artist and other parties involved. The university continues to forge ahead on previously announced projects in the neighborhood, such as Mosaic Village. I ran into Dr. Carter at an event a few weeks ago and he was excited about the progress they've made. JCSU is giving community members the opportunity to voice their opinions and share ideas about the future of the Northwest Corridor at the Second Annual Indaba Community Forum on Saturday, March 31. The free event will be held from 8 a.m. to 4 p.m. inside Grimes Lounge in the Mary Joyce Taylor Crisp Student Union on campus (100 Beatties Ford Road), and will include breakfast and lunch. Topics to be discussed regarding the Northwest Corridor are: economic development, land use planning, education, small business development, and community leadership.